World History: A Short, Visual Introduction is the ideal path to understanding the historical events that influence Christian history. Caitlin Corning's introduction covers the most important people, places, and events with precision and clarity. The major scenes are creatively illustrated by artist Joseph Novak, whose crisp modern style brings history to life. The result is an articulate, no-nonsense approach that guides readers through the events of world history - from prehistory to the present day - that have shaped Christianity in the past and affect it today. World History is part of the Christianity and the Liberal Arts series, which recognizes that many Christians are eager to deepen their understanding of the liberal arts, yet have limited time to do so. By reviewing key fields-philosophy, history, literature, world religions, and the arts-in a concise, creative way, Christianity and the Liberal Arts books will inspire new insights for a new generation of Christian life and ministry. 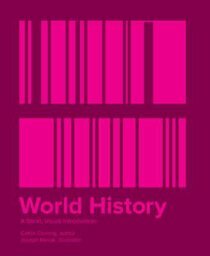 About "World History: A Short, Visual Introduction"
Caitlin Corning is Professor of History, George Fox University. Series Introduction; Volume Introduction; 1. Roman Empire; 2. Early Medieval World (500-1000); 3. High And Late Medieval World (1000-1500); 4. Early Modern World (1500-1700); 5. Enlightenment And The Eighteenth Century; 6. The Nineteenth Century; 7. 1914-1945; 8. Postwar World; Recommended Reading; List Of Maps.